We meet the charming Lassiter in the summer of 1939 as he’s stealing his way through London and living the high life with his English girlfriend Sara (Jane Seymour), an accessory if not all-out accomplice to his stylish crimes. 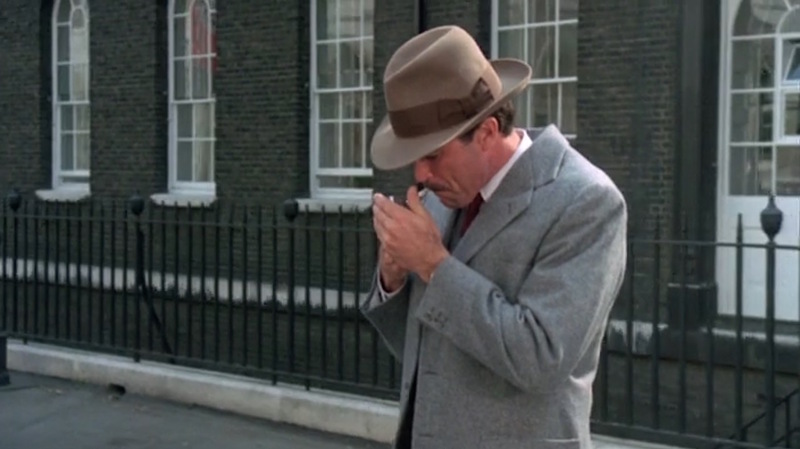 Scotland Yard’s onto him, however, and entraps him into breaking into the German embassy and stealing millions of dollars worth of diamonds that would finance Nazi spy operations in South America. After some initial resistance, Lassiter begrudgingly agrees to help the government and begins planning his heist. Part of his plans include a trip to stake out the German embassy grounds, despite the anti-fascist protests outside. We know he’s stressed because he earlier admitted that he quit smoking, but now he’s flicking his Zippo to light his Luckies as he wanders into the embassy itself. Given that his options are spending 20 years in an English prison, successfully stealing jewels from the Nazi government, or to die trying… it’s reasonable that he would be stressed! Tweed—the rough and rugged woolen fabric often associated with country suits and traditional sportswear—can be nicely adapted for the city, particularly in traditionally businesslike colors like blue or gray. Lassiter opts here for the latter, a light gray barleycorn tweed two-piece suit with a timeless cut. 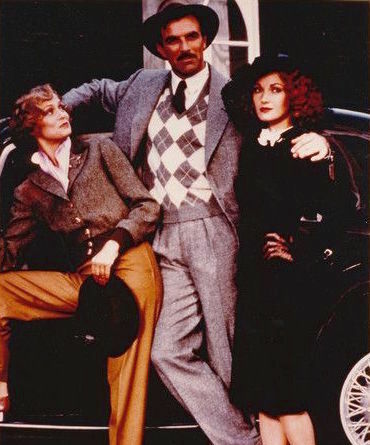 Three-button jackets are most flattering on taller gents, so the 6’4″ Tom Selleck in this three-button single-breasted suit coat. The ventless jacket has notch lapels, patch pockets, and three buttons on the end of each sleeve. 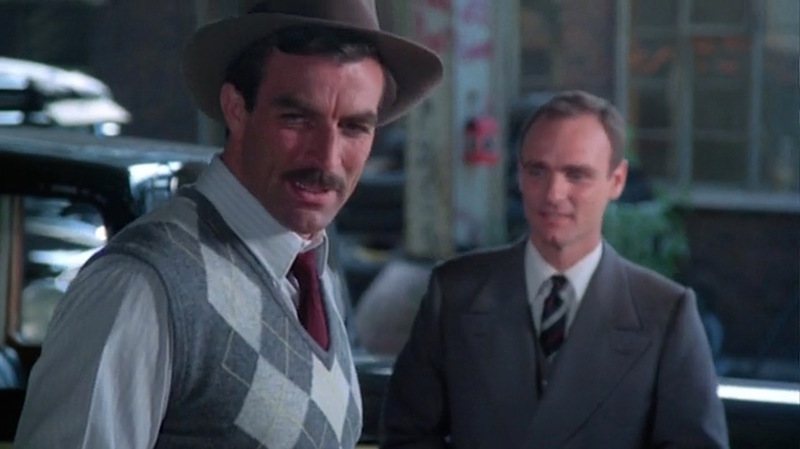 Anyone making the argument that argyle can’t be badass need look no further than Tom Selleck in Lassiter. The bona fide badass of the ’80s not only sported argyle knitwear, but a sweater vest at that. The argyle pattern of solid-colored diamond-shaped lozenges, often with an overlaying grid of diagonal inter-crossing lines, originated in Scotland around the 17th century but grew fashionable in the years following World War I, first in England before crossing the pond to the United States. As an American living in London, Nick Lassiter would be very familiar with the natty benefits of the pattern and his argyle sweater vest nicely supplements his suit for an interesting layered look. Lassiter’s gray knit wool V-neck sweater vest has a cream argyle pattern on the front with thin cream lines inter-crossing across it. The V-shaped neckline, armholes, and waist hem are all ribbed in the same gray fabric as the rest of the vest. Lassiter wears the same shirt and tie that he wore with his gray box-checked sport jacket when he confronted Inspector Becker (Bob Hoskins) at his family’s home. The faintly light gray-and-white candy-striped shirt has a slim spread collar, front placket, and rounded single-button cuffs, and the bold burgundy silk tie jumps out against the muted shirt. 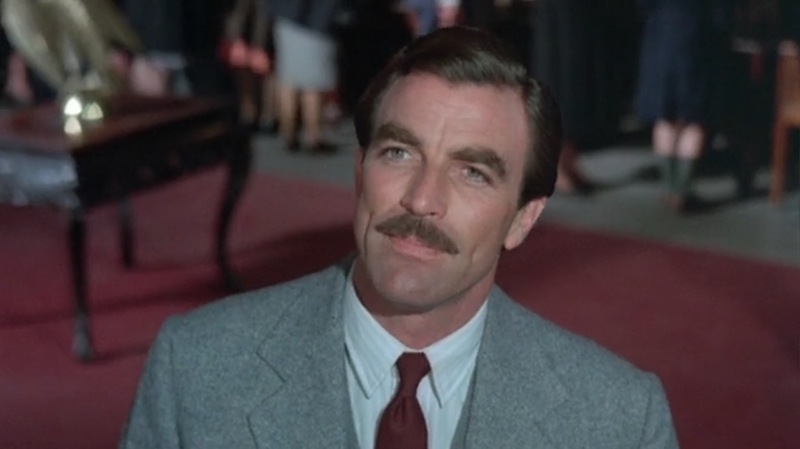 Selleck’s trademark mustache gets plenty of glorious screen time in Lassiter. The suit’s matching trousers have double reverse pleats, side pockets positioned straight along each side seam, and jetted back pockets, and the bottoms are finished with turn-ups (cuffs). Though Lassiter’s sweater vest covers his waist, we can assume he’s wearing his usual brown leather belt as it would coordinate with his dark brown suede oxfords. Lassiter’s light taupe socks don’t necessarily match his gray trousers or brown shoes but provide an otherwise neutral transition between the two. Lassiter wears his trusty tan felt fedora with a brown ribbed grosgrain silk band. His timepiece is a subtle but elegant tank-style dress watch that was most common for men during these early decades of wristwatch popularity. The gold rectangular-cased watch has a light rectangular dial and is worn on a dark brown leather strap, though Lassiter also wears a watch with a similar-looking case on a gold expanding bracelet similar to those offered by Elgin during the era. Lassiter’s dangerous assignment reawakens his dangerous smoking habit. 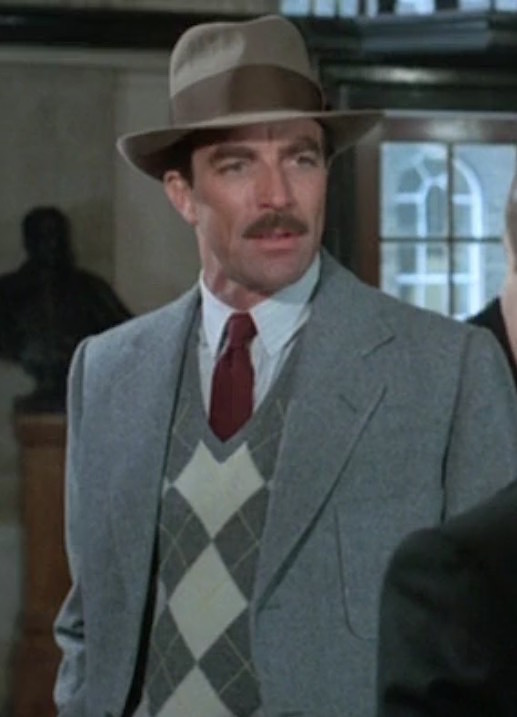 Though he’s an American, Selleck’s Nick Lassiter looks every bit the finely tailored English gentleman as he cases the German embassy in his tweed suit and argyle sweater vest. Max Hofer: Are you an admirer of German culture, Mr. Lassiter? Lassiter: Well, where I come from, Max, we like things a little lighter, if you know what I mean. I was hoping you would get around to covering Tom Selleck’s clothes in “Lassiter”! In my opinion, this little-known movie has the finest menswear outside of the James Bond series. I sincerely hope you will also cover the brown Donegal sport jacket Lassiter wears when he is first arrested, as well as the gray box-checked sport jacket. And yes, an argyle vest can be badass, just like a cardigan! 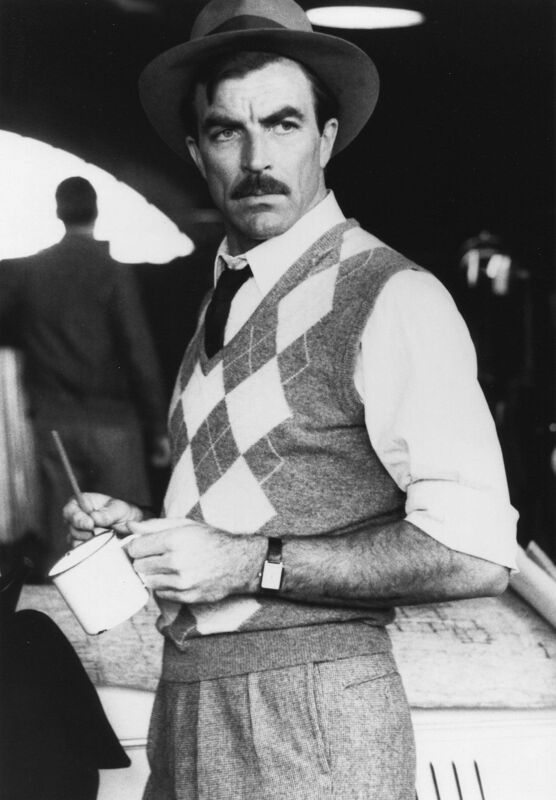 I agree – some excellent period attire on display, and Mr. Selleck wears it all very well. I love the sport jacket you’re talking about. I was half-considering that for the inaugural Lassiter post, but I can assure you I’ll prioritize a further examination of it in my next! Good film, was wondering if you’d attempt it. I’d like you to look at some of the other outfits he wore in it, if possible. Absolutely – you can count on it! Anything in particular you’d be interested in seeing first? Finally! I was quite shocked to see you cover this. I’m the Tom that has sent you a few requests to do so. Thanks! My pleasure, Tom! Thank you for introducing me to this fun movie. 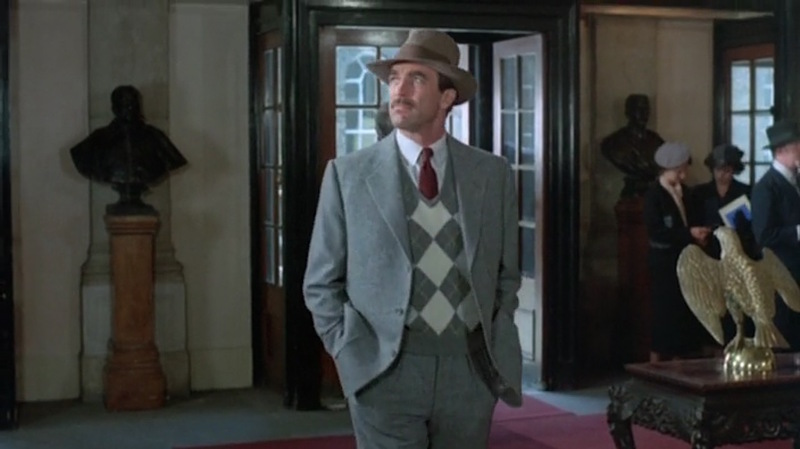 You can certainly expect to see more of Selleck’s fantastic period outfits in posts to follow.